You can align your submenus to the left, right, or centered below the top level menu item, when in jQuery Enhanced mode. With a jQuery Enhanced menu, you can set the alignment of your submenu to the left or right edge of the menu bar, or centered beneath the top level menu item. 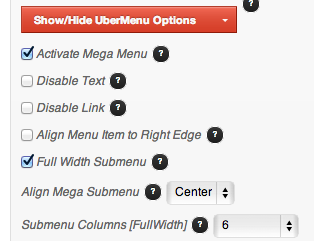 Just set the Align Mega Submenu option on your top level menu item. When centering a submenu, it is still bounded by the extents of the menu bar. So you can think of this as being “as close to centered without exceeding the bounds of the menu”. Take the example of a top level menu item at the far right of the menu bar. If the submenu were centered, almost half of it would be positioned beyond the right extent of the menu; this may well be beyond the extents of the screen itself, making the submenu inaccessible. Instead, when calculating the center position, the right edge of the submenu cannot go beyond the right edge of the menu bar to make sure the submenu stays on the screen. In this case, for example, “Centering” and “Right Aligning” would result in the same submenu position.